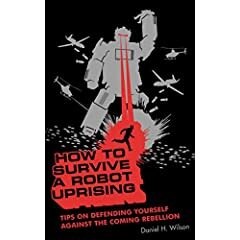 How to Survive a Robot Uprising is along the same lines as the popular Worst Case Scenario series. I like this one better though, because a) it is written by an actual roboticist, and b) there are interesting stories of actual robotics scattered throughout the survival advice. This book gives you the know-how to defeat all manner of robot configurations, weapon systems, and sensor methods. Recognizing humanoid robots is covered (“Follow your nose. Does your friend smell like a brand new soccer ball?”). It also gives a handy timeline for how the Robot Uprising is likely to progress, and what to do afterward. We all know that it’s only a matter of time (see Turing Test 2005) before we are kneeling before the robot overlords, but this book will help put it off as long as possible. Awesome. I, for one, am _so_ buying this to prepare for the inevitable coming of our robotic overlords. Them main thing, though, in not to forget to remind them, that as a trusted blogger personality, I will be helpful in rounding up humans for work in their underground roller bearing caves.